Long time kiter and also Retailer here with a review. I don't think I've ever reviewed a neo product but felt compelled for a couple of reasons. 1. These are a bit more expensive than the usual top so many people overlook them but I reckon their performance is more than worth the additional cost. DISCLAIMER: I sell these tops so take this for what it's worth, just my opinion as a kiter/paddler and I think it may be of worth to you. Last week during one of the cooler days where the wind was 25-30kn, the days high temp was only just in the lowest of 20's and it was very late in the afternoon after work that I got down for a quick kite an hour prior to sunset. I mistakenly didn't bring my regular pull over neoprene top which I normally wear, so threw on the Zip front Neo top. First thing I love about this top is the "Hot Stuff" wool like, plush liner which makes it as easy as pulling on a cotton jacket. The plush liner traps a nice layer of water and retains it in the weave which your body heat then warms to keep a warm wet layer inside the neoprene. 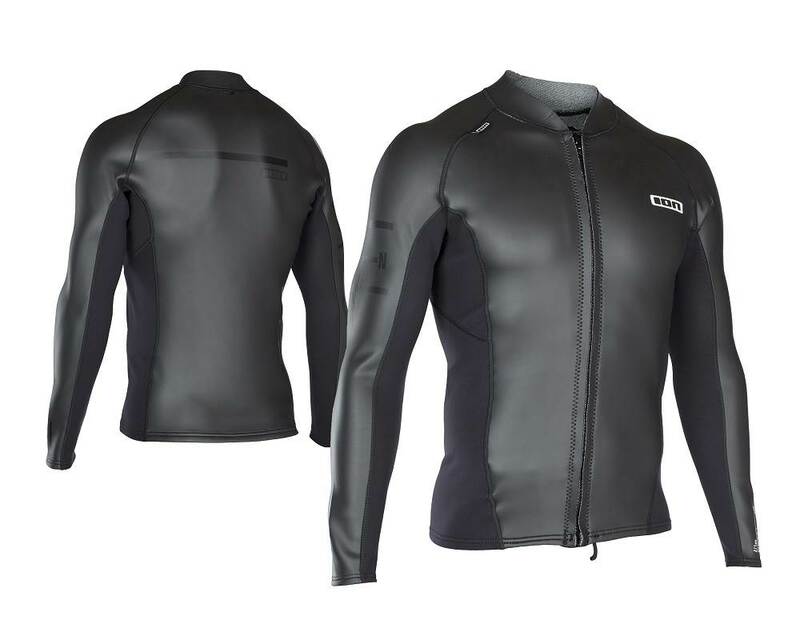 The Neoprene is super stretchy and doesn't restrict movement whatsoever and is a very snug fit without feeling tight. Very thin and flexible top with amazing warmth in sunny but cool conditions. The outer of this top is a combination of smooth seal skin and standard neoprene in the underarms and sides. The normal neo is on the sides of the torso and inside of the arms to prevent chaffing and the stickiness of the smooth skin from grabbing during movement. The smooth 'seal type' skin is non porous and doesn't absorb or hold water. This is the best part, water doesn't evaporate off the skin in the wind which eliminates the evaporative cooling effect so you don't need a thick layer of rubber to insulate from the cold outer layer. The side benefit is that the matt smooth rubber like surface also absorbs the heat from the sun making it extra warm when in the sun. Although the water was quite cool, and the wind chill downright freezing, I was warm both on, and more importantly, off the water whilst packing up at sunset. I was very surprised and was also able to enjoy the zip front top once more when it came time to pull the jacket off. Unzip and peel and it was off, no Houdini contortionism to remove the wet top. Although these are not cheap, I can wholeheartedly recommend this top for both paddling and also kiting/windsurfing. I wouldn't recommend it for surfing as the zipper would undoubtedly be a problem when laying on the board. Anyways, had to share as this was worth sharing IMHO. If you don't like or do like this kind of review, drop a comment below. If the nay's exceed the yay's, I'll post them only on our FB page for those that want this sort of thing.